From kryptonite for Superman to plant toxins for poison ivy, chemical reactions within the body's cells can be transformative. And, when it comes to transmuting cells, UC San Diego researchers are becoming superhero-like copycats. Recently named Blavatnik National Laureate in Chemistry, Neal Devaraj, along with research colleagues Henrike Niederholtmeyer and Cynthia Chaggan, used materials like clay and plastic to make synthetic cells—or "cell-mimics"—capable of gene expression and communication rivaling that of living cells. According to some scientists, these research results, published recently in Nature Communications, could be among the most important in synthetic biology this year. Working with cell-mimics is a hopeful scientific endeavor because of the potential applications artificial cells present. For example, after more research to ensure their safe and reliable application, synthetic cells eventually could be engineered to recognize and attach to cancer cells in a patient's body, enabling precise delivery of drugs—without impacting healthy cells—and reducing the side effects of chemotherapy. Additionally, artificial cells could serve as biosensors for toxic chemicals in the environment, letting us know, for example, that water is unsafe to drink. They could improve diagnostic testing with their small size and biocompatibility, which could enable a group of cell-mimics to perform various tests simultaneously using only a tiny amount of blood. Interactive cell-mimics could even form artificial tissues that develop independently into tiny, micropatterned structures—kind of like computer chips that could form on their own. Scientists also anticipate that the very process of making synthetic cells could lead to a better understanding of life's origins and evolution. "If we are going to develop synthetic materials, we need to have the individual units cooperate," noted Devaraj, a professor in UC San Diego's Department of Chemistry and Biochemistry. Until now, cell-mimics have communicated somewhat by exchanging small molecules; for example sugar and hydrogen peroxide. Yet they could not talk to each other through large molecular proteins like insulin or growth factors. In a basic way, it's like when we try to send a large file attachment via email only to receive an error message. So, just as it is important for us to be able to successfully deliver information by email, it is also extremely important for the body's cells to communicate through protein signals. To address this limitation in artificial cell synthesis, Devaraj and his team made microfluidic chips from a silicone polymer to push out droplets of DNA encoding green fluorescent protein (GFP), minerals from clay and precursors for acrylic plastic. Then, using ultraviolet light and chemicals, they triggered the formation of a spongy membrane around each droplet, while the DNA within each droplet condensed into a gel-like substance to create a neo-nucleus. The researchers also gave their cell-mimics the ability to synthesize proteins. Their methodology enabled the transfer of information across the novel membrane. The result was a cell-mimic capable of sending protein signals to neighboring cells. According to Niederholtmeyer, these talkative pseudo-cells, "look and behave like natural cells but they are made of completely artificial materials." Other life-like qualities of the cell-mimics include quorum sensing—behavior changes among dense cells, task distribution and cellular differentiation according to local environment. "We were surprised and excited that our cell-mimics could so accurately sense their density, meaning that they could sense how many neighbors they had, even though they were not in close contact with them," said Niederholtmeyer. "That was surprising because the molecular network that led to the quorum sensing behavior in our cell-mimics is very different from how quorum sensing works in bacterial cells." Like superheroes, the synthetic cells are resilient, remaining intact for long periods of time after being frozen and even at ambient temperatures. This resiliency makes them ideal candidates for environmental sensors, an opportunity for future research by the UC San Diego scientists. Additionally, the stability and programmability of cell-mimics makes them exciting for other scientists as well. "They are easy to share between research groups and can be programmed by DNA to express any RNA, protein or pathway," added Niederholtmeyer. According to the postdoctoral scholar, the results from the three-year study present many potential uses and ways to further develop these cell-mimics. 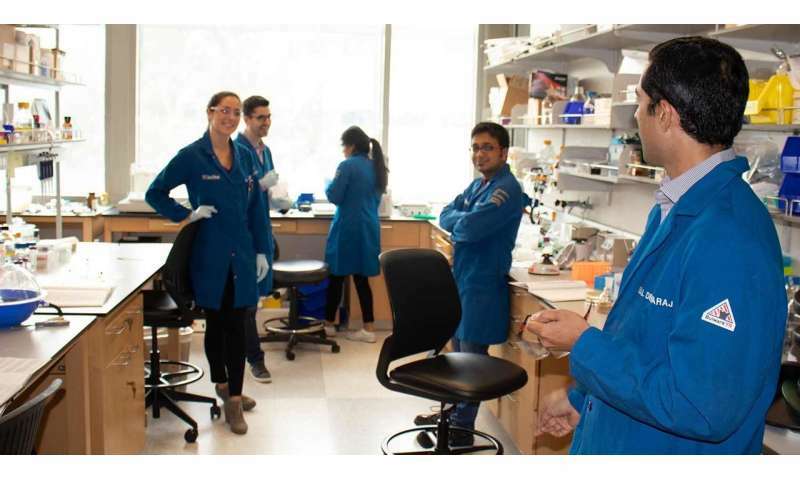 "For example, we have already been contacted by other researchers at UC San Diego who would like to try to use materials from our cell-mimics in living cells to fight diseases. We are also interested in further developing the membrane, for example so that it can respond to stimuli and to make it more biologically active. Our cell-mimics are very programmable," said Niederholtmeyer. "Another important advantage is that they are so stable, which will make sharing these cell-mimics in collaborative projects easy." Sounds very much like the researchers will be working on a replacement for the biological human cell that perhaps might never be susceptible to invasion and/or infection by fully biological microorganisms. A mimic-cell that cannot be compromised in any way. A superhuman, perhaps?